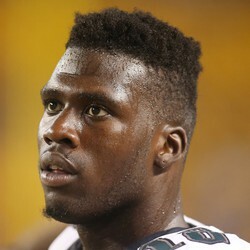 The Eagles have released former second-round pick Dorial Green-Beckham. If you were to go back and look at dynasty ADP from two years ago when Green-Beckham was drafted by the Titans, he was being taken as a top-30 player in startup drafts. Truth be told, this isn't all that shocking, as the odds were stacked against Green-Beckham once he was traded away from the Titans for essentially nothing. He'll likely latch on somewhere as a goal-line presence, but nothing more. Over his two years in the league, he's seen a rather-high 141 targets, resulting in just 68 receptions for 941 yards and six touchdowns.